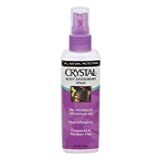 French Transit – Crystal Body Spray, 4 fl oz spray | Medical Supplies and Equipment. Crystal Body Deodorant™ spray is made of Natural Mineral Salts which eliminate odor by leaving an invisible protective barrier against odor-causing bacteria. It is fragrance free, non-sticky, non-staining, leaves no white residue and can be used by both Men and Women. I am not a “Man’s man” but I am a man and I have a “Man’s man” body. (I smell when I sweat) Unfortunately I guess I also have sensitive skin, as I was recently forced to switch deodorant/antiperspirant because my usual brand was out of stock, and I started to suffer itching and burning with several other brands. Being a geek like I am, I googled the issue and found that it is quite common. Most of the articles or comments I read about the issue ended with the person trying this miracle crystal rock deodorant. So I did some research and found out that it’s not really a deodorant or an antiperspirant but an anti-odorant if such a thing exists. It doesn’t cover odor, or prevent perspiration, but it prevents the bacteria that cause odor from forming. I would say that if your average or below on the sweaty/stinky scales then this would be a great product for you. It does seem to do the job well, but it really only lasts about 12 hours. And as a man with a “Man’s man” type of body I will say that you need to apply IMMEDIATELY after existing the shower. I have had a few times where I may wait 20-30 mins and it seems like it’s already too late. Overall I think this is a good product and a welcome alternative to having goo or paste under your arms all day. I have been using the rock for about a month, and it keeps me fresh the entire day at work most of the time. (desk job) I am also considering trying the deodorant stick specifically for men made by the same company. I started this rock on September 15th, 2006 & it still has a little way to go. I asked the technician who did my mammogram if she knew the best product to use safely for a deodorant because I grew concerned about the risks of commercial deodorants. Lemme tell ya, this was the 1st beand I used only because it was the only one available at the time & I am a sweater big time with hot flashes to boot! This deoderant is the best I have ever used in my life. I live in the extremely hot desert & if it keeps me dry & smelling fresh all day (and sometimes just to insure myself, I use it 2-3Xs a day), but when left at home & only used it once in 24 hours, it kept on working. It seems costly when you look at the price, but it’s the cheapest thing in my bathroom as it has lasted me now over 1 1/2 years with the promise to last over a year. I have since bought my 2nd & about to use it as the 1st one is down to the size of a dime. lol I tried the new one which is a bit smaller, but i found that all brands of this stuff is basically the same. For the woman & her husband who got rashes, it probably won’t help to switch brands as it can burn after shaving if you shave daily. I shaved to often a few months ago & got a rash so I went back to my 3Xs a week shave. This stuff is from Thailand and is a very cheap ingredient. They make a heap, we buy it & save a heap as $8 even &10 is definitely worth a year or more of deoderant protection & nothing is cheaper. I would have settled for 6 months.